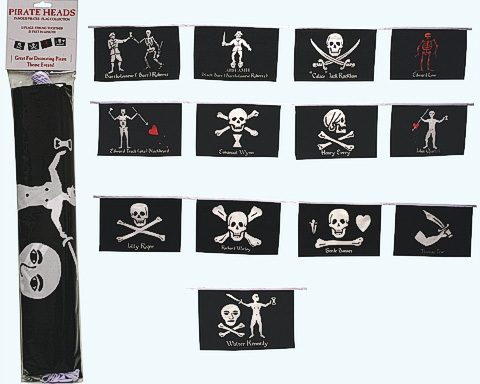 13 different Historic Pirate Flags make up our colorful polyester string banner. They are perfect for themed parties of all occasions, or use as general decoration to bring out the pirate in you! Each flag is approximately 11"x17.5" in size, with a total length of 25'. This set includes the following pirate flags: Bartholemew Roberts, Black Bart, Edward Low, Edward Teach, Emanuel Wynn, Henry Every, John Quelch, Jack Rackham, Jolly Roger, Richard Worly, Stede Bonnet, Thomas Tew, and Walter Kennedy.